January 1, 2018 at 9:45 am. For HH Architects, designing churches isn’t just a thing they do; it’s a calling. For more than 47 years, HH Architects — headquartered in Dallas — has earned its reputation of providing tremendous expertise and knowledge through its innovative designs and creative solutions. This award-winning firm has had the privilege of working with and planning campuses for many of the fastest-growing and top-attended churches of all sizes and denominations across the nation. In a recent conversation with two of the firm’s leaders, we asked them to discuss the trends they’re seeing in the church market. Bruce Woody — who serves as President and CEO — is in his 29th year with the 47-year-old firm. Creative Director Mark Ashcraft, who has been with HH Architects for 17 years, agrees. Locally, in Dallas, HH Architects designed a church for North Dallas Community Bible Fellowship that provided a non-traditional church setting fronting along a major freeway. Having come from a 60,000-square-foot office building, the church had no preconceived ideas of what it envisioned its campus to look like. This allowed HH Architects the unique opportunity to provide a new image and identity to the community. 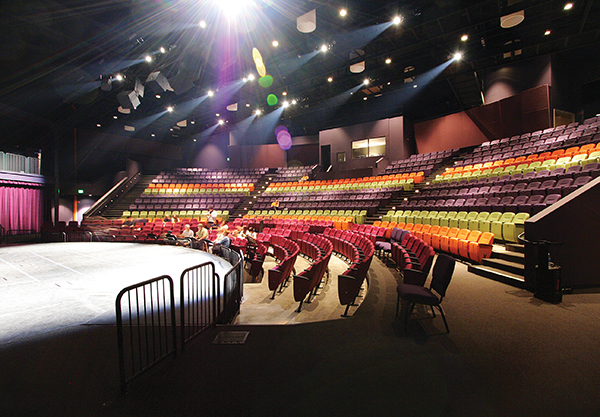 The church had initially contemplated a facility that consisted of 143,000 square feet with a 2,500-seat worship center; but, through HH Architects’ unique Strategic Positioning services, the team was able to meet the church’s ministry objectives by developing half of the space originally contemplated at one-third of the original cost. 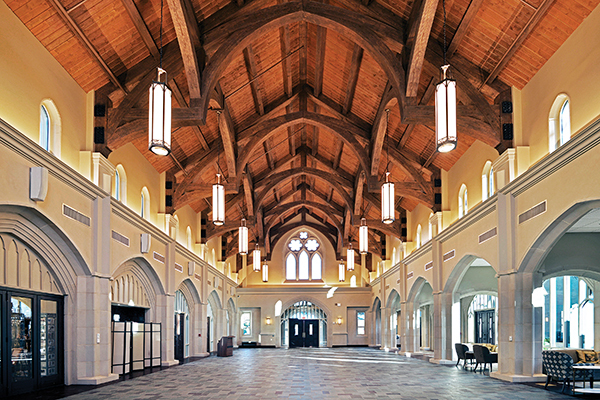 At Church of the Incarnation, located near University Park, Texas, HH Architects created a detailed, gothic-style sanctuary, education building and welcome center. They used heavy timber construction and stone detailing, helping to maintain the integrity of the existing campus while providing the modern amenities required for the current ministry. With Crossroads Christian Church in Grand Prairie, Texas, the owner wanted a children’s facility “so unique and engaging that the experience of the facility would be as memorable as going to Disney World.” For HH Architects, it was refreshing to have such an open creative palette, which led to an innovative and rewarding education building for the community. In Brentwood, Tenn., HH Architects created a Master Plan for a 60-acre site that has allowed for seven phases totaling nearly 600,000 square feet to be developed in 14 years. This includes a 2,500-seat worship center & education building; administrative offices; a 250- seat specialized auditorium for those with hearing loss; a Connection Center with a 1,300-seat multipurpose worship / dining venue for youth and young adults; and a fellowship hall and chapel. For Cornerstone Chapel in Leesburg, Va., [profiled on the cover of the November / December 2017 issue of Church Executive], HH Architects designed a 108,000-square-foot, lodge retreat-influenced church on the outskirts of Washington, DC. The design speaks uniquely to the desired need for a respite retreat center to serve busy professionals and commuters in the area. 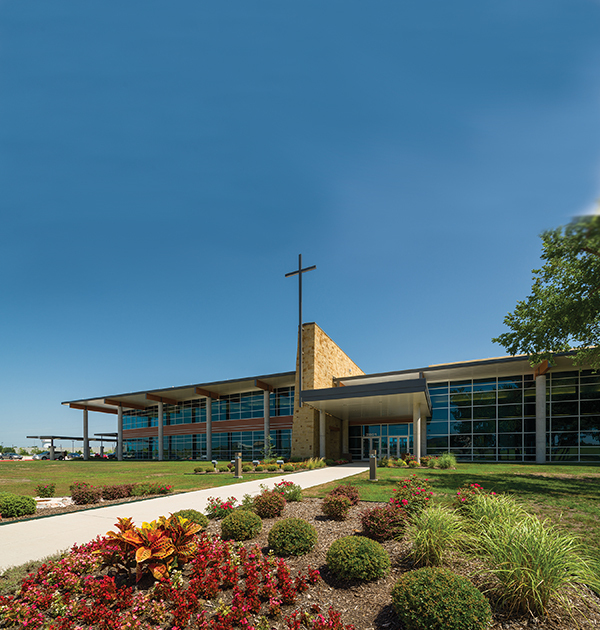 The campus is located on 30 acres of land with an 80-foot fall across the property that allows the church to crown the hillside while providing serene, natural spaces for worship and connectivity. At Calvary Chapel Fort Lauderdale — one of the top-five-attended churches in the nation — HH Architects designed a 170,000-square-foot private high school, including an award-winning performing arts theater. The church and school not only provides multiple spaces for worship, but hosts programs and events daily to allow the surrounding community to become more involved and connected with the ministry. At First Baptist Church Covington in Tammany Parish, La., when the owners brought the design team onboard, they were in a capital campaign for a 150,000-square-foot education facility with proposed future phases for worship and administration. Using the firm’s unique metrics-based Strategic Planning model, HH Architects was able to condense all desired projects into a single phase, including a 2,500-seat worship center, hospitality space, education space and administration, netting a savings of more than 70,000 square feet and significant cost savings from the consolidation. Through these working partnerships, HH Architects has learned a lot about “what works” when it comes to designing for church communities — not only what’s relevant today, but what will continue to be relevant in the future. Here’s what two of their leaders have to say. 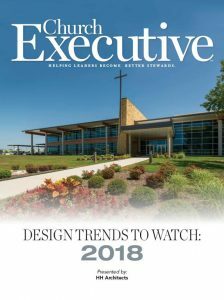 As you look forward to 2018, what design trends do you see as drivers in the house-of-worship market, and why? Ashcraft: A focus on community. We’re seeing common spaces where people can actually gather, not just move from space to space; areas where people can come early or stay late and just hang out. It’s providing community central points, social centers, places that aren’t just for the weekends. Woody: We’ve also seen more churches come back into neighborhoods, and densely developed areas including downtown business districts. Currently, we’re working with several churches located in downtown districts and major city centers across The United States, including one that spans nine city blocks. Ashcraft: With neighborhood churches, we’re seeing some of the growth through additional satellite locations. Or, it could also be multiple venues on the same campus. It might be a church with 5,000 members, but it’s spread across five venues that offer more intimate experiences and allow those communities to come together and bond. Woody: I also see a re-focus on appropriately sized churches. There has been a lot of discussion that many churches are downsizing, but that’s not necessarily what we’re seeing. We’re seeing churches grow, but being more aware of building no more or less than what they need. Really, it’s just about ensuring these spaces are very intentional, very purposeful. We’re designing flexible spaces. By that, I don’t mean big spaces where anything can take place — we’re designing these spaces for very specific, various functions. Yes, we might be able to change the room’s shape and size and volume, but it also involves technology and understanding the specific functions anticipated for these flexible spaces. We’ve repurposed a lot of what we used to call ‘multipurpose’ spaces with more defined needs and functions in mind. Ashcraft: Being able to digitally ‘tune’ the space and change the environment for different ministries is driven by the needed flexibility, with a few additional pieces of equipment versus the physical structure. Woody: We’re also seeing a lot of redefining, recreating, repurposing, and rebuilding what a traditional church might look and feel like. It’s about getting churches to understand that when they plan new facilities for growth, they don’t just do it for their current generation; they do it for future generations. This includes helping older generations to understand new facilities might not look like what they’re used to. Ashcraft: Part of that redefining, is some pushback against the ‘big box’ church of the past few years, which stripped away everything that identified a building as a church. Download the whole eBook here! conform to the traditional look and feel. And frankly, a lot of older traditional facilities aren’t designed to serve the functions of today’s churches. Sometimes you can go in and fix some things, and sometimes the best decision is to tear down and start fresh. This goes back to understanding that the building needs to function, first and foremost, to serve the ministry of the church. Ashcraft: Visual clarity is the key. The building needs to reflect the particular culture of the church, the DNA of that ministry. People are looking for that. They want to understand what the space is ‘about.’ It needs to speak the language of that particular ministry. Woody: We believe the ministry needs to drive the architecture. That can’t be achieved if we always conform to a pre-conceived idea of what a church ‘should’ look like. Ashcraft: Another rising trend is the integration of outdoor space. It’s just as viable for ministry as enclosed space, whether that’s green space, plazas, water features, or other site amenities. There is a deeper understanding of the need to provide respite, a place to get away, to retreat and unplug, or just to catch your breath. Woody: It goes back to the ‘come early, stay late’ mentality. When the worship service is over, don’t let people just walk out; give them a place where they can enjoy fellowship with their kids or with other families in an outdoor setting. Whether it’s a cold or warm climate, we find that people like to be outdoors. They like relaxing spaces where they can sit and enjoy a cup of coffee or visit with someone. We’ve found a lot of church clients are receptive to that, design-wise. Ashcraft: All of this comes back to working with churches to design spaces that create opportunities for face-to-face connections, forming real relationships. Woody: Meaningful spaces are the goal. Everyone is busy; we want our church facilities, our campuses, to promote respite, retreat and community in addition to letting people know, You’re going to be spiritually fed. What about multisite churches? Are they asking you to make all their campuses or locations mirror the look and feel of the home church? Woody: No, not necessarily. If the main church is well established and has a certain look or feel, and the church starts a satellite campus in a neighboring community, the people they’re trying to reach might not have emotional ties or expectations related to the main campus. Again, every church facility needs be authentic to its DNA. Ashcraft: This really ties back to the neighborhood church movement. A church which has five venues in five neighborhoods, still has a common thread across those campuses. The ministries might be the same, but a little bit of uniqueness to each community, design-wise, needs to come into play. Young families are a demographic that every church seems interested in reaching. What resonates with them, in terms of design? Ashcraft: It comes back to hospitality and common spaces. There is an intentional focus on the user experience across the campus. The amenities you’d expect to see in everyday life — a café, a play space that’s open throughout the week that moms can visit. Maybe there’s a party room they can rent for birthdays, and so on. 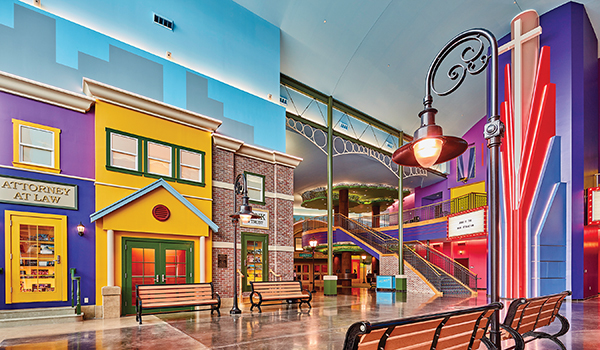 Woody: Another thing we’re seeing with family-friendly spaces: they just need to be relevant. 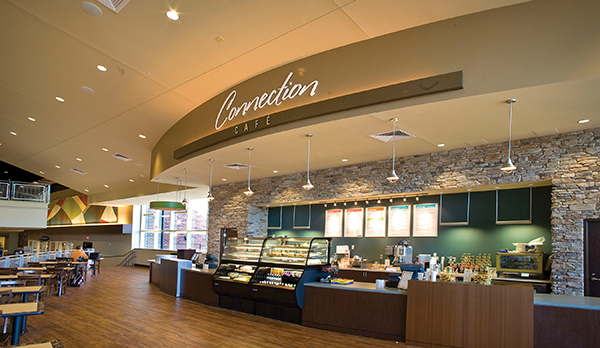 When it comes to church design, common hospitality spaces should draw in and reach out to all age demographics. We strive to design spaces which appeal to everyone in the family unit. These can often become spaces they can enjoy and fellowship in together. OK, so, are there design trends that you anticipate falling off, popularity-wise, in the coming year? Ashcraft: True video venues seem to have reached their peak. The video venues have served their purpose well, but we’re seeing the tendency for churches to desire live worship and teaching on their satellite campuses. Woody: Over the past decade, we’ve seen a decline in dedicated family life / recreation centers, but they’re now being envisioned as community centers. In fact, some of the facilities we’ve designed are specifically designated as community centers during the week, and the church uses the space for worship on Sunday. It’s taking what may have been perceived originally as an inward focus and gearing it outward, towards the community. As churches look to grow and expand their campuses, how do they attract newer generations without alienating the older generations? Woody: Have conversations with key leaders early to open the dialogue. Understand that for some, this might be the church they’ve grown up in, got married in (and maybe their kids even got married there). There’s a history, an emotional significance, tied to the facility that has to be recognized and dealt with. But, if a facility is no longer serving the church’s needs functionally for their ministry, a church leader has to be able to convey that message. They have to be able to say, ‘Our ministries are being driven by the facilities. We need facilities being driven by our ministries.’ Once you can convey that message, and provide a compelling vision, the church can more readily accept the need for potential change. People have to realize their church isn’t designed to provide only for the generations of today; we’re also providing for the generations of tomorrow, and next year, and way beyond. Based in Dallas, HH Architects is a nationally recognized industry leader and award-winning firm. For more information, and to view the firm’s portfolio, visit www.hharchitects.com.